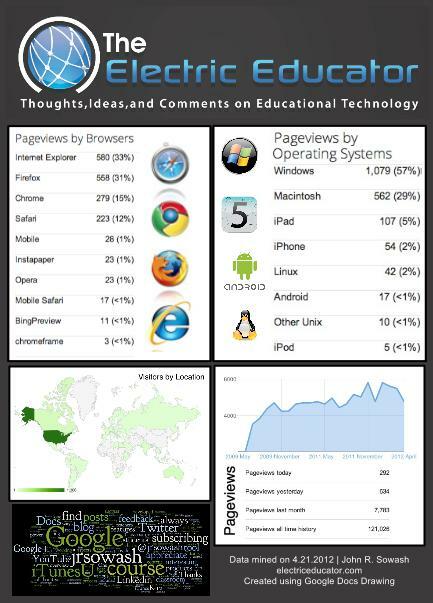 I have been blogging on the Electric Educator since 2008. It's always interesting to take a look at the statistics of the blog: readers, browsers, operating systems, and locations. This is an interesting way to observe changes in computing technology (mobile visitors were very rare when I began blogging) and to better understand the global reach of the Internet. I assembled this infographic in Google Docs Drawing using screen shots from Google Analytics and the Blogger Statistics page. The wordcloud was generated using Wordle. If you feel inspired to create a similar post on your blog, please leave a link so that I can take a look!